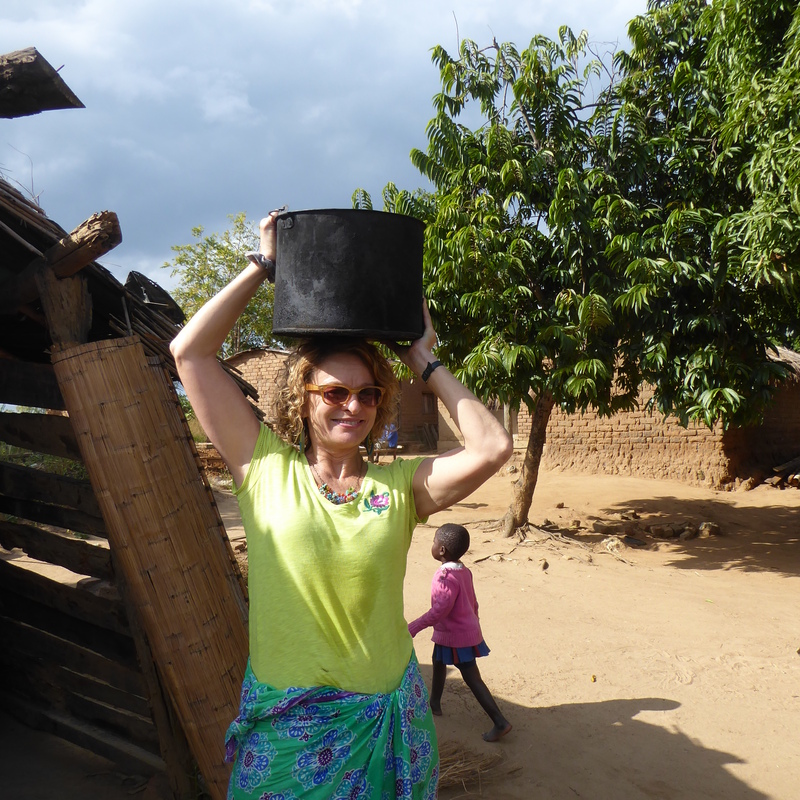 Today mom and the other volunteer women tried to be Malawi women. What an experience for everybody. First they washed dishes. 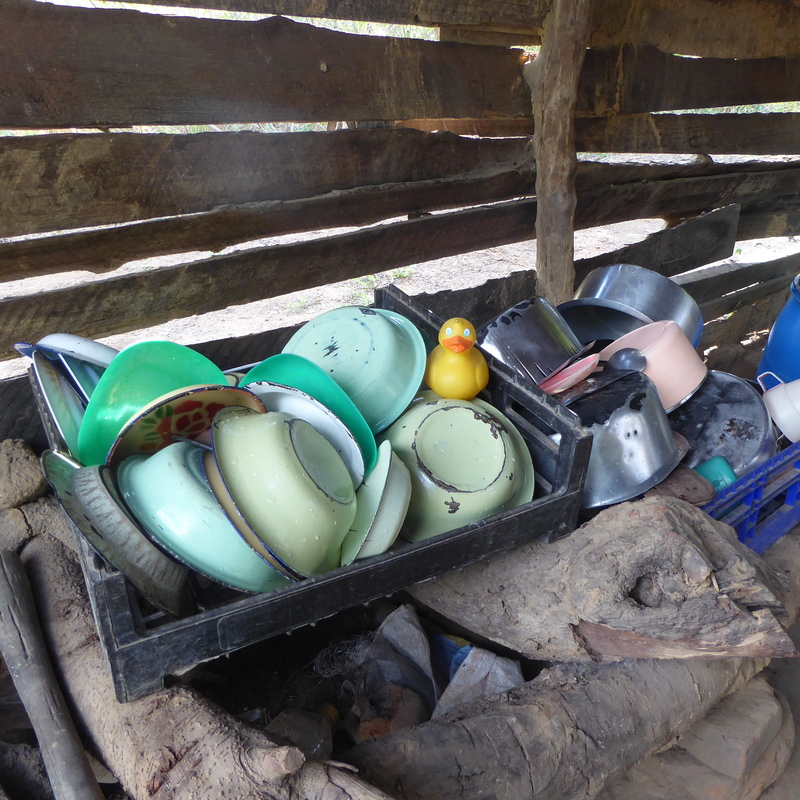 Here are the washed dishes, air drying. Next was chopping wood. Linda is doing a great job. Chopping wood is hard work. 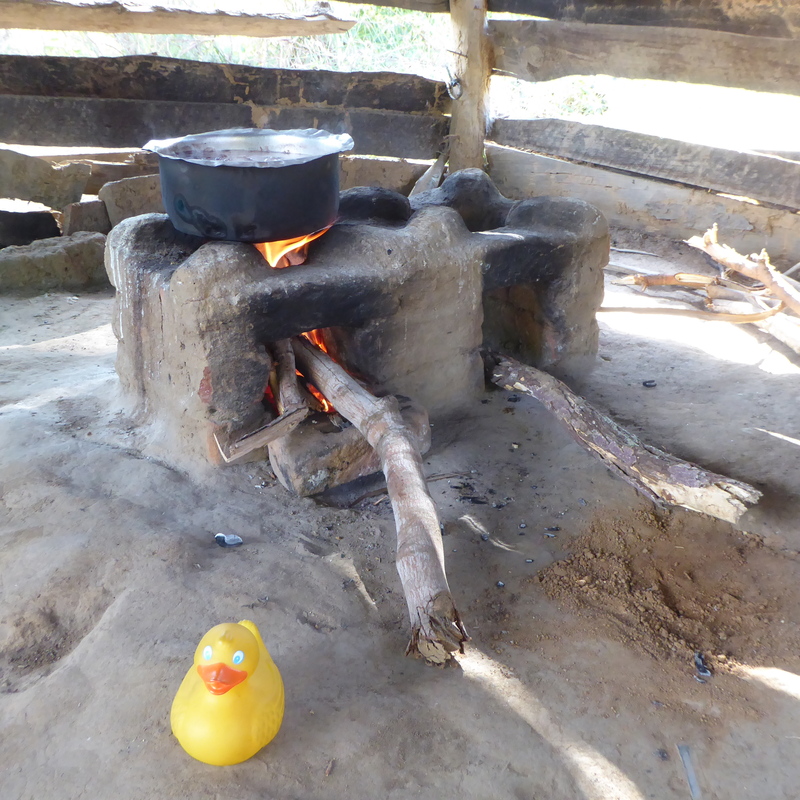 Wood is needed every day for fires to cook and to heat water. Red beans are cooking on the changu changu moto stove. Having beans is a treat. Beans are not available to eat every day. Next the women went to the well and carried water back to the house. Here is Rebecca showing how it is done. The volunteer women all tried, but it is not so easy. Here is Denise carrying water. 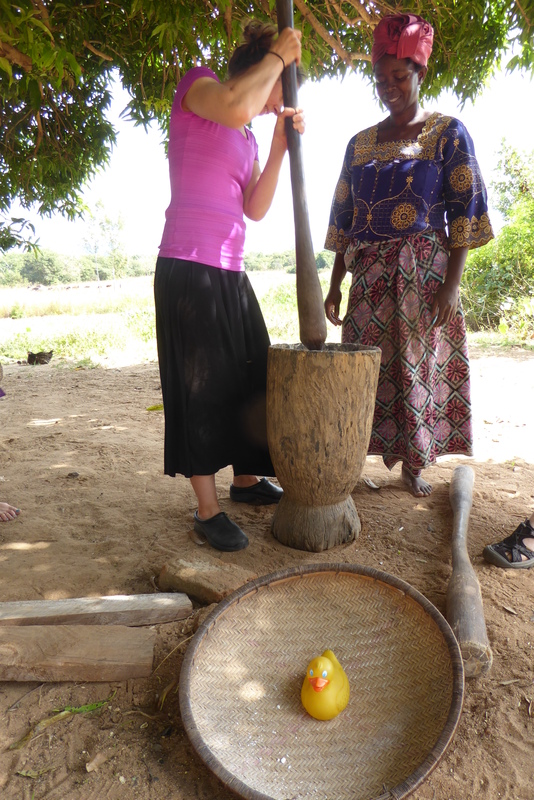 Now it is time to prepare the cassava for eating. Cassava is a root vegetable, similar to a potato. It does not have a strong flavor, and is eaten almost every day. Our cassava had already been dug from the ground. Then it was peeled and soaked in water. The next step is drying the cassava. That was already complete when we arrived at the home of Catherine and Rebecca and their families. 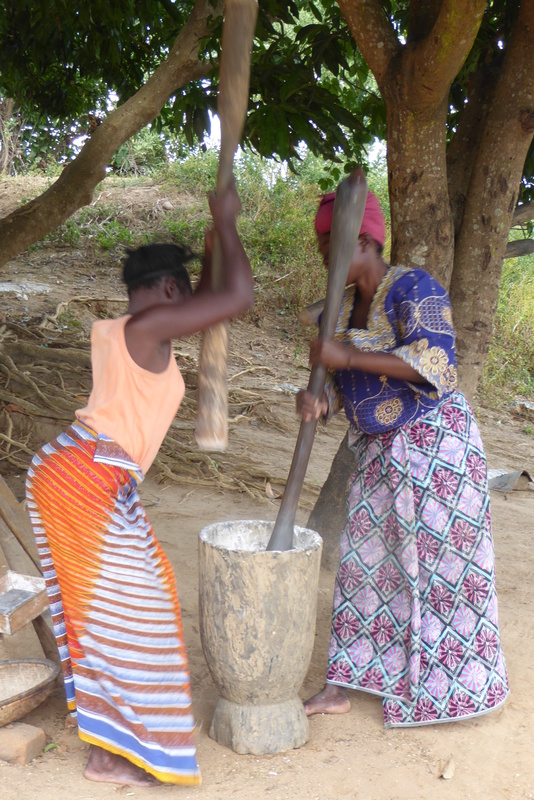 The volunteer women broke the cassava into small pieces. 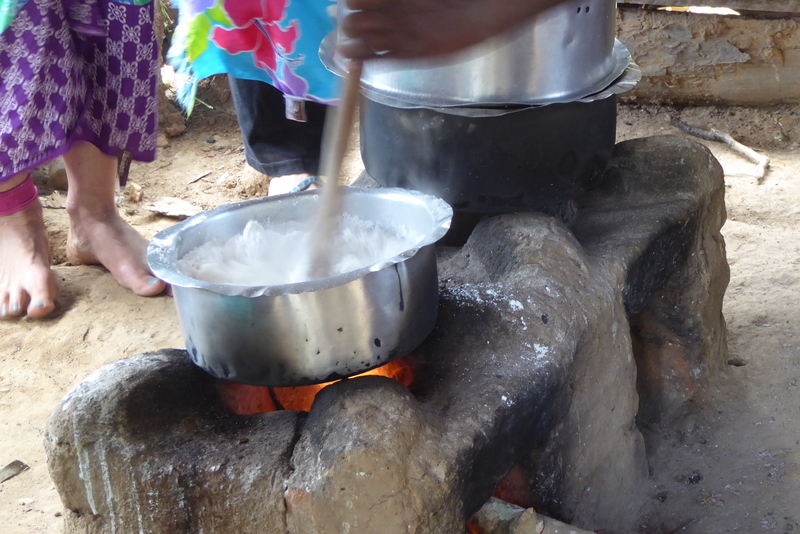 Then the cassava must be pounded into a flour like substance. 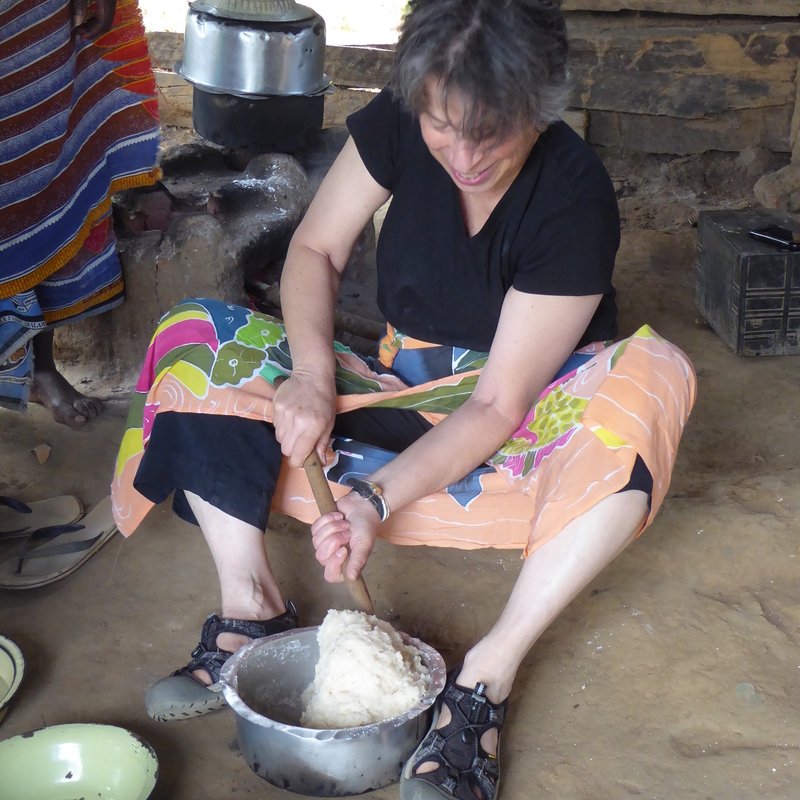 Linda is pounding cassava now. Rebecca and Catherine show the women how it is more effective if two ladies pound together. After the cassava is pounded into a powder, it must be sifted. 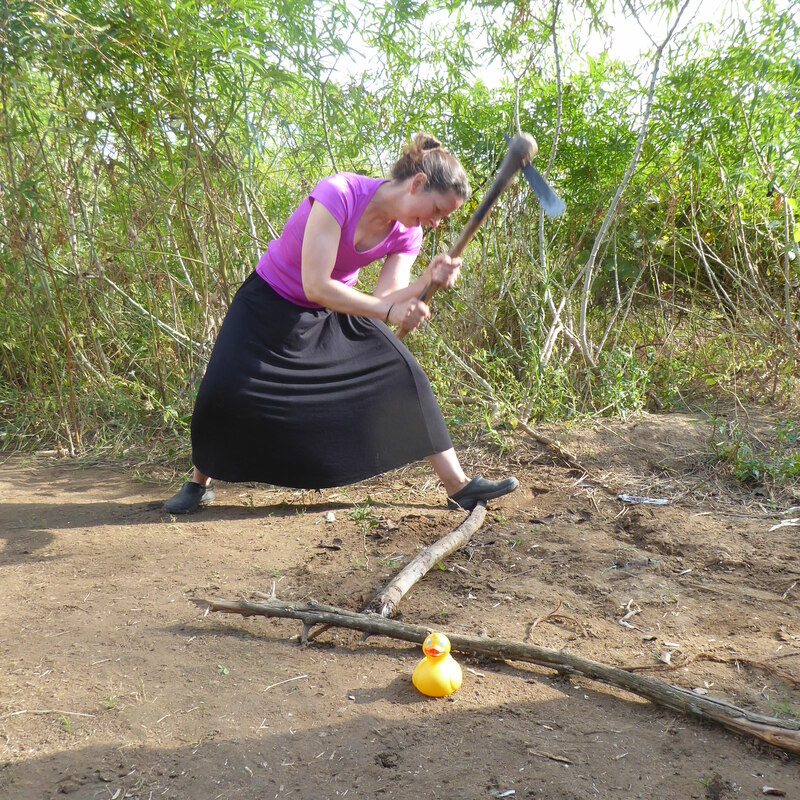 Deborah is sifting the cassava now. 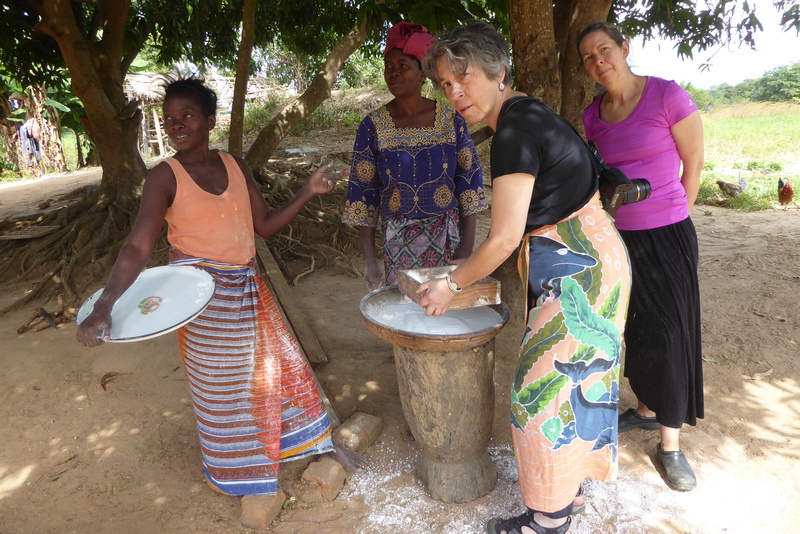 When sifting, the women must keep the cassava low, so it does not blow onto the ground. Now the cooking begins. After cooking, the cassava is called nsima. (The n in nsima is silent. This food is pronounced seema) The nsima is very stiff and difficult to stir. Deborah is stirring the nsima now. 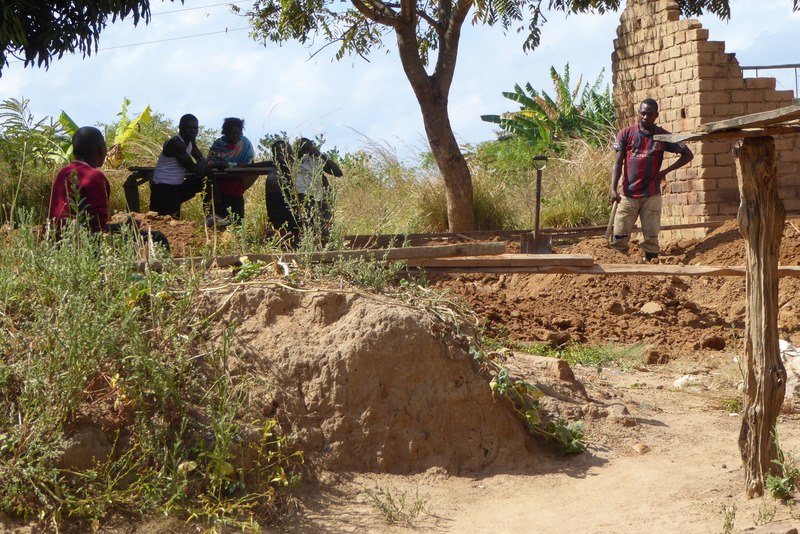 While the women are doing this hard work, the men are building a house without machines. The foundation is dug with shovels. The men must also make the bricks. Soon 17 nieces and nephews will be coming to stay with Catherine and Rebecca and their families. They are in boarding school now, and their parents have died. So more room is needed and much more work will be required. 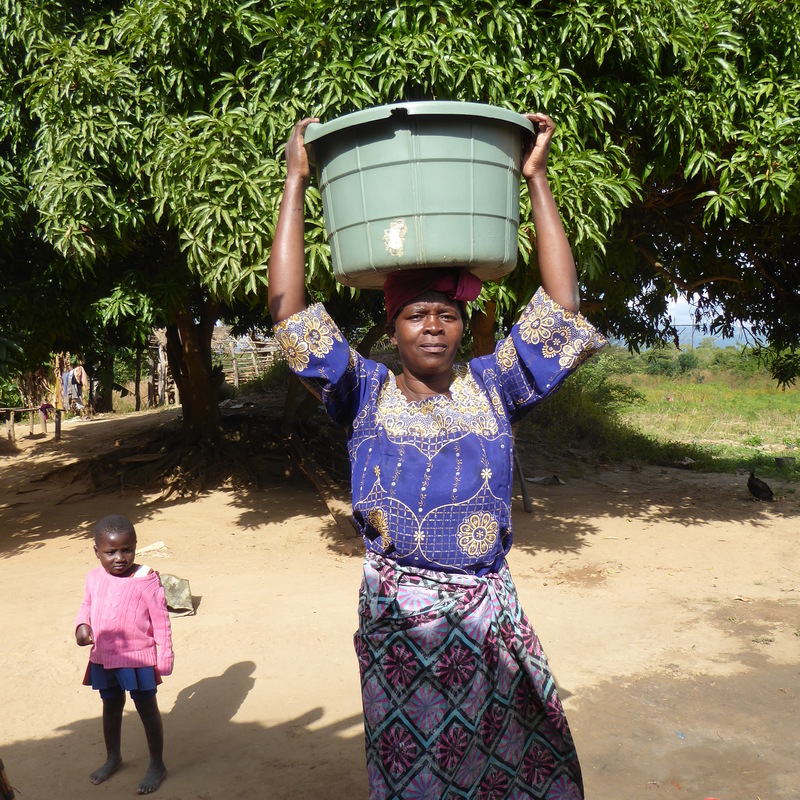 Rebecca went back to school after she had her children and she is now a preschool teacher. She was one of the four teachers pictures in our last post. She is an amazing lady. Naturally her day starts very early, as she must carry water, chop wood, cook and wash dishes before she starts teaching, about 7:40 a.m. In Malawi, life is hard, but we found that the people are willing to share what they have and they always have a smile. I, Zeb the Duck, stayed in my traveling bag when the children came home. Children always want to keep me, so I don’t pose for photos when many are around. I do like children and do not want to disappoint them when I have to go home with mom. The people we met in Malawi showed us that Malawi really is the warm heart of Africa. This entry was posted in Africa, Malawi, Uncategorized and tagged Africa, carrying water, chopping wood, Colorado Traveling Ducks, Malawi, nsima, preparing cassava. Bookmark the permalink. So much hard work and never ending too. 17 extra family members will make it even more difficult. I hope they all pitch in. That many additional people would send me into a panic, but they calmly plan for it, accept it and will handle it. They are such kind and amazing people. Never heard any complaints either. Thanks for reading and commenting.